This months issue focuses on the top 30 technology innovations and award winning security solutions. 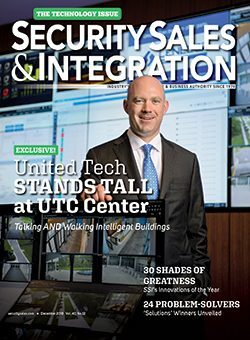 The many brands of UTC’s Climate, Controls & Security division can be found demonstrating the ultimate in synergies at its new Center for Intelligent Buildings. Executives weigh in on the Center’s impact, as well as busy happenings in the LenelS2 and Interlogix branches. Whether you’re at the top, bottom or anywhere else within a security company’s pecking order — everyone appreciates things that can make their job easier or more productive. Whatever your role is there’s bound to be something in SSI’s 2018 Top 30 Technology Innovations to help you climb higher. SSI’s fourth annual Security Solutions Awards demonstrate how industry manufacturers helped their integrators and end users resolve highly specific applications needs with standout products and technologies that translated into smiles all around. Taking on a hosted solution like access control as a service (ACaaS) can seem daunting to traditional-minded installing contractors. SSI speaks with subject matter experts who peel back the offering’s mystique to deliver how-to brass tacks for adopting and adapting to this promising business model.